Ducal Pine Extending Table And 4 Chairs. Seats 6-8. Ducal Pine Extending Table And 4 Chairs. Seats 6-8. The table is antique pine and cones with 4 matching upholstered chairs. From a clean non-smoking household. The centre piece is in better condition than the main table surface. 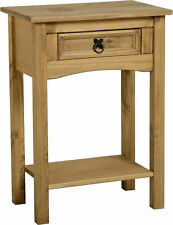 New listingconsole table - Ducal Furniture brand, table used in our hall, as per photo. Condition is Used - pretty good nothing major wrong. Solid Pine Dining Table and 6 Chairs - Extendable to 6/8 seater. This round dining table extends to an oval and can comfortably sit 6 or 8 at a squeeze. The table is sturdy and would be a great upcycle project. Please note there are marks on both the chairs and table as it has been well loved but nothing to detract from looks. Chairs all have fire labels. Tilting pine table, easily seats 6 people. Three foot pedestal which top swivels upon (see pictures). Used but in good condition, top recently stripped and re-varnished. (Will split into two for transport). Lovely console table - Ducal Furniture brand, table used in our hall and has scratches/marks on the surface due to keys and other items being placed on it but otherwise nice condition. Measurements 72cm height (highest point at back), 90cm across at widest point at the back, 46cm deep at the max point. Cash on collection preferred. Maida Vale, W9 area. 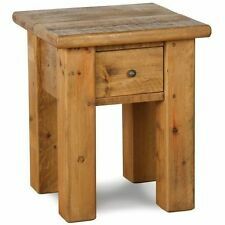 DUCAL SOLID PINE TWIN PEDESTAL EXTENDING DINING TABLE SEAT 6-8 (Max 215cmx106cm). Condition is Used. dimensions without extended leaf 170cm x 106cm. 4 small heat marks. Four Drawers - Middle Shelf Missing. Height 52 cm Top 110 x 57 cm. 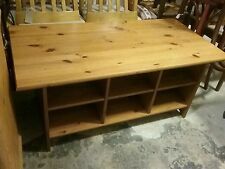 Ducal Solid Pine Victoriana Coffee Table with magazine shelf. Substantial coffee table circa 35 years old. The table was given an update a couple of years back with Annie Sloan Chalk Paint in Duck Egg Blue and Old English White followed by several coats of chalk paint wax for durability. Ducal Refurbished Lamp Table Side Table Occasional Table End Table. Lovely Ducal Lamp Table. The top has been sanded back and lightly bleached to remove the original stain. Then finished with a polyacrylic top coat. The table has two drawers which can be opened and used from either side, and a very useful storage space/magazine rack. Delightful Pine Demi Lune by Ducal. An original Ducal pine demi Lune console table wiuth drawer. Delightful looking quality made table. DUCAL STORAGE CABINET, PAINTED IN ANNIE SLOAN" PARIS GREY"
DUCAL STORAGE CABINET. This cabinet has been hand painted with two coats of Annie Sloan "Paris grey". your chosen transport if previously arranged. This unit has a lift up hinged top, adjustable shelf, glass fronted door and a bottom drawer, giving plenty of storage for a small unit. DUCAL Solid Pine Lamp Table (H0.58M W0.40M D0.57M). Built to the usual DUCAL standard& quality, this lamp table will add a touch of class to any living room. QUALITY SHABBY CHIC SOLID PINE NEST OF 3 TABLES COFFEE SIDE TABLE Grey. Condition is Seller refurbished. Size - 53 cm wide 43 cm deep 49 cm high Thank you ! 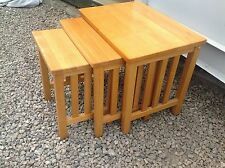 Great Ducal Pine Coffee Table with Two Side Tables. To help with your space saving needs - two side tables neatly hide inside coffee table. Featured with one dovetail joined drawer & two side tables. Great Drop-Leaf Table by Ducal. Good item as when leaves, each 44.5cm, dropped easily tucks away. Very Good overall condition. Our 1800 sq ft unit is based on a small industrial estate, close to Peterborough City centre, there is free parking right outside our unit. Help is always on hand for the loading of your item if required. Top Quality Ducal Pine Console Table Prima Transfer "Scrolls & Accents". We work from a Modern Showroom in Central Weston Super Mare. But we are happy to shabby up any piece you like if that is your preference. Great solid pine lamp table made by Ducal Approx 50cm tall 57cm square. Also has a shelf underneath. No major damage still very sturdy few scratches and dents but would be a great little upcycle project !!!!! Collection only please. Very Good Condition, few minor marks with normal use, not particularly noticeable - see pictures. in: 23.6 (h) x 24 (d). Manufactured by Ducal in the UK. in pale cream ivory colour chalk paint with rub back to edges. Solid pine rigid construction. Ducal rosedale corner table in excellent condition. Only selling due to moving house. Other ducal rosedale items being listed. Ducal Rosedale Pine Wooden Console Table - 2 Shelf - Curved Edge. Sturdy table in mahogany gloss finish. Flat edge and curved edge with 3 legs. Ducal Coffee Table - 1600mm length, 530mm width, 460mm height. Ducal The Pine People Pine Coffee Table/TV Table - project - refurbished - upcycled . Condition is Used. Table has been sanded ready for new varnish or painting. This was something I was going to take on myself but no longer able to continue. Great little project for someone Wonderful table in good condition Collection only. With Original Ducal Label. In Good Condition. The unit also sits on castors, making it easy to move around the room. Any large and unsightly dents/marks will always be repaired. The top has been stained with Jacobean Walnut and then slightly sanded back for a rustic/distressed look. Condition is Used. Dark (Rosedale) coloured pine. Table top has a few shallow scratches but generally in good condition. console table - Ducal Furniture brand, table used in our hall, as per photo.